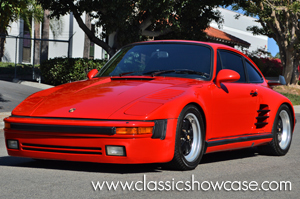 This 1979 Porsche 911 has been modified to the slant-nose 930 Turbo-Look. It has been fitted with upgraded steel fenders as well as a steel slant-nose front end. In capturing the Turbo 930 look, the previous owner purchased all original parts for a 930 and had them professionally installed. Attention to detail was the owner’s goal, and he achieved that with this special example. The entire car is in good condition, and rests upon a set Fuchs 16-inch 930 Turbo Wheels. It has also received a new catalytic converter, and passes stringent California smog requirements. Inside this 911 you’ll find black leather sports seats, a period-specific Alpine CD/FM/AM stereo with 2 Amps, a removable custom "Boom Box" speaker system in the back seat, factory Air Conditioning that blows cold, Power Windows, Remote Mirrors, Driving Lights, and a Shifter that operates the 5-speed manual Transmission. The 911's dash has no tears or rips and presents in good condition. The car is ready to be enjoyed as is, or easily taken to a Show/Driver level. The car includes an extensive file of receipts. *Please note that this car has a salvage title due to the theft of the car along with its original motor. It was replaced with a 1985 Carrera 3.2L motor. Porsche began doing Slantnose, or ‘Flachbau’, conversions for their 930 sports cars back in 1981, replacing the vehicle’s typical front end with a more aerodynamic nose featuring pop-up headlights. The look was inspired by the 935 Group 5 racer and, according to some, it made the old 911 stand out even among its peers. It is thought that fewer than 600 Slantnose Turbos were made for the USA. Porsche made its first and most significant changes to the 930 for 1978 model year, enlarging the engine bore by 2 mm (0.08 in) to a total displacement of 3,299 cc (3.3 L; 201.3 cu in) and adding an air-to-air intercooler. By cooling the pressurized air charge, the intercooler helped increase power to 300 PS (221 kW; 296 hp) at 5,500 rpm and 412 N⋅m (304 lb⋅ft) of torque at 4,000 rpm (DIN); the rear 'whale tail' spoiler was re-profiled and raised slightly to make room for the intercooler and the spoiler was now called the 'tea tray' spoiler. The hydraulic clutch was also more civilized. The suspension benefitted from new anti-roll bars, firmer shock absorbers and larger diameter rear torsion bars. Porsche also upgraded the brakes to units similar to those used on the 917-race car. While the increase in displacement and addition of an intercooler increased power output and torque, these changes also increased the weight of the vehicle, especially the engine, which contributed to a substantial change in the handling and character of the car compared to the earlier 3.0-liter models.